Kyrgyz Central Election Committee is going to officially confirm the results of parliamentary elections, which took place on October 10. Due to scandalous practice of violations, committed during the vote count, it took three weeks for CEC – unprecedented case in CIS. As soon as newly elected deputies take an oath the parliamentary form of rule in Kyrgyzstan will become the reality – for the first time in its history. Therefore, the republic will have a break before the next inevitable seizure of power. There are several simple and obvious reasons for further destruction of state institutes. Here are some of them. First, at least two parliamentary parties – Ata-Jurt (led by Kamchibek Tashiev) and Ar-Namys (Felix Kulov) – declared the necessity to reconsider the Constitution towards strengthened presidential rule. At the same time, the Constitution – recently adopted in June, 2010 under "strong" support of the population, scared by destabilization after overthrowing President Bakiev and which de facto voted for the stability – directly prohibits the Constitutional amendments in the next ten years. However, there is a loophole: the amendments in the Constitution can be made if they are supported by 300 thousand voting citizens. This number is quite realistic for above-mentioned parliamentary parties: they gained nearly the same number of votes during the elections. Considering the local electoral specifics, by "gained" we mean organized and bought. 300 thousand electors represent so-called regular electorate; about 150 thousand voters per party. It was also necessary for each party to gain 5 percent body of voters (according to the latest estimates, the total number of listed voters in Kyrgyz Republic reached 3 040 597 people). - In order to ensure sound development and stability in Kyrgyzstan it is necessary to strengthen the power of the President – said Felix Kulov on October 27. In his opinion, the current Constitution "does not allow the President to make the decisions on important issues". "If the ruling coalition in Jogorku Kenesh (the parliament – editorial note) sees the threat of disintegration the President must have enough power to restore stability. This is possible only through expansion of his functions" the party leader believes. In the opinion of Mr. Kulov, it is not a problem to amend the Constitution which has the immunity for the next 10 years. "There are people’s initiatives, allowing to process these procedures", he affirmed. The demagogic rhetoric about the necessity to reconsider presidential power at the expense of recently announced parliamentarism cannot deceive anyone. Every involved voter knows that the struggle of Kyrgyz clan leaders for individual power in the republic is not only not ending, but also progressing. The formation of coalitions these days is temporary solution. The reason is that parliamentarism and presidency is not the fight of new and progressive against former and outdated regime. This is new wave of aspiration of the same people, boring for everybody, and constant deserters in their aspiration to take over profitable positions in the state management and build the irreducible barricades for competitors. Today’s fight is legalized: it is protected by deputy’s mandate. The announced plan for reconsideration of presidential power is only the cover for those who want the power – the preparation for final battle. For the first time in the history of Kyrgyzstan new Constitution approved the parliamentary rule as the alternative to previous practice of presidential power, when the leaders built the system of total robbery for the sake of the clan wealth. Later on, the forces, willing to undermine parliamentary rule, gained some strong positions. They are not looking for development. They want to go back to former state management system that allows to deceive people, rob them and build the personal empire. It is not fundamentally important whether pro-presidential parties form the ruling coalition or stay in the opposition. De facto new Kyrgyz parliament gained its own grave digger in it its heart – the supreme legislative body. The aspiration of some forces towards democratic development is used by others as the instrument against such trends. No doubt that this grave digger is able to do his job fast: there are parties (their leaders and administrative mechanisms), regular electorate. There are funds, generously donated by sponsors. There are enough seats in the parliament in order to promote any decision. At the same time, possible successful performance of the parliament on the development of legal base and revival of economic, social and political situation in the republic will be fiasco for those, who see themselves in the presidential chair. This means that the point of no return will be left behind. This is totally unacceptable for pro-president parties. Therefore, the destructive elements will be introduced in the parliament by grave diggers. There is single purpose – to show public that there are no alternatives for presidential rule in Kyrgyzstan. As a result, we may see the further disintegration of political system and another seizure of power. Secondly, the grave yard for Kyrgyz parliamentary rule can be seen today while it is presented as the firm bases for foundation of new democracy. The evidences were mentioned by Mr. Kulov, the leader of Ar-Namys party "If President Otunbaeva proposes us to form parliamentary coalition, in our turn, we will propose to establish wide coalition and the government on national confidence". At the same time, Mr. Kulov noted that such ministers council must include "not only the representatives of 5 parliamentary parties, but also those who lost the elections: overall, about 8-11 parties". "The outsider parties will not have equal representation, but they will have the opportunity to represent their interests in state management". Besides, in the opinion of Mr. Kulov, the parties, delegating their members to such government, will be able to recommend their candidate for the position of Prime-Minister. Therefore, behind so-called government of national confidence and going against Constitutional rules (because in this case, non-parliamentary parties have the opportunity to participate in the formation of government) they get rid of personal responsibility in case new government fails. The failures of new government are predictable in conditions of poor socio-economic and political conditions in Kyrgyzstan. The proponents of strong presidential rule will sharply criticize such failures. Will the citizens have to face new – unscheduled – seizure of power? Third, what do people think about in this situation? They have nothing in their minds. They do not believe the political moves are made for public benefit. About 45 percent of voters in Kyrgyzstan ignored the elections. Not all 29 parties, willing to run in the parliamentary elections, had the opportunity to exchange the ballots into votes. The open evidence is that Kyrgyz nationalism shuts doors for many voters. In condition of no ideology, the marginalization and public degradation, which hit Kyrgyzstan and other post-Soviet republics, destructive processes in the area of education and culture led to situation when people, not representing titular nation, are not involved in state administration. Looking into party candidate list you will see that such lists do not reflect real ethnic constitution of Kyrgyz population. On one hand, not only people were killed in the interethnic clashes during tragic events in southern part of the republic. 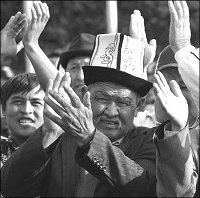 "Kyrgyzstan is our common house" (the doctrine, proposed by Akaev) eliminated last hopes of over 80 ethnicities, residing in Kyrgyzstan. It is crystal clear now who the master in this house is. This is not brother-Kyrgyz. This is someone, who uses his ethnic group in order to gain power at any cost. In case of success, this person robs everyone. In this sense, the decision of 45 percent of population to stay home in the Election Day is not the decision of infantile people. This is very strict position of people that see non-legal seizures and bloodshed in the south as political hopelessness of new Kyrgyz elite in their responsibility for the future of the republic. The decision of nearly of half of voters to ignore elections is an obvious boycott. This is the protest from people, not willing to involve in the political games that not only may lead to anti-constitutional usurpation of power but also interethnic battles. Such boycott shows that new, old and any other elites have no electoral support in Kyrgyzstan, deceased by interethnic clashes, breakdown in all sectors of socio-economic life. If tomorrow there are trends towards another coup, nobody will protect the government as an institute. Fourth, the real power emerged in Kyrgyzstan just recently; it has not gained enough strength. This is the power of totally corrupted system. Today, it is the pith of the domestic economy and the edge of civil life. Life without bribery and corruption is impossible in Kyrgyzstan. The citizen, which did not give a gift to his fellow and which did not get a gift, feels awkward by the end of month. Such behavior challenges the system. The paradox is that corruption, which has strong positions in Kyrgyz society, ensures the stability in the republic. Kyrgyz statehood, independence and sovereignty are the dry fruits in this dry tree…The corruption has total power in Kyrgyzstan: no political turmoil, revolutions or social tensions could undermine its positions. The flow of bribes in "the island of democracy" totally replaced democratic flows and any progress of the republic towards the better future. In this concern, the current deputies of the parliament face challenging tasks: perhaps, they spent money and time for nothing and will never get closer to the circle of bribes. If you promise the bonus for the foreign investors in revolution you can go for another coup and the parliament will be dissolved. Last. The union of political elites, their mixture with criminal structures in Kyrgyzstan is the parable for everybody. For instance, last year by the decision of President Bakiev the anti-drug Agency, whose mission was to counteract the most profitable business in the republic, was abolished. Today, people with criminal background are listed in the parliamentary parties. As a result, in these conditions most of citizens found themselves between the hammer and anvil: corrupted officials, practicing total lawlessness, and criminal structures. We are not even talking about the protection of interests, freedoms of citizens by disoriented and demoralized law enforcement and supervisory bodies and courts. Thank God the top authorities in the republic are not yet subordinate to criminal leaders, whose representatives interfered all governmental structures, facing no resistance from corrupted law enforcement bodies. The criminal groups strengthen their positions also thanks to growing drug traffic from Afghanistan. Such groups are strongly interested in the chaos. This means that the next coup will inevitably take place in order to gain benefits from the nation, weakened by multi-year disloyal governmental policy against its own citizens. It is not difficult to name another dozen reasons why the legal integration of Kyrgyzstan to the international community may be postponed to uncertain number of years. It is nearly impossible to maintain the statehood and economy in the republic, suffering from political battles and where the gap between rich and poor reached phenomenal size and two third of population is hardly making a living or working abroad. - In order to use parliamentary rule effectively we need advanced political culture and, so far, we have not reached this level – said Mr. Kulov. It is hard not to agree with him. The only point is that these are not us, but you that need such political culture and sense of civil responsibility; you and all those who ignore current catastrophe of common people and continue way to the top, driven by clan agreements. To be completely honest, the winning parties have no chance to become the symbol of straightforward leaders. One nation is more than 150 thousand votes and one ethnicity.